Vietnamese naval ships and Chinese vessels have collided in the South China Sea, Vietnamese officials say. The incident happened as the Vietnamese navy was trying to prevent the Chinese from setting up an oil rig in an area claimed by both nations. No shots were fired, reports say. But Vietnamese officials said that water cannons were used on their ships. The incident is the most serious between the countries at sea in years, with dozens of boats now in the area. Vietnamese officials said on Wednesday that the Chinese ships intentionally rammed their vessels. Several sailors were injured, AP quoted one official as saying. Vietnamese maritime police official Ngo Ngoc Thu told media in Hanoi on Wednesday that Chinese boats had collided with Vietnamese vessels three times since 3 May. Details are sketchy, but there is no doubt that this is one of the highest escalations of tension in many years between the two neighbours. China wants to establish an oil rig and start drilling soon in the area only 120 miles (193km) from Vietnam's coast. This is the first time China has tried to explore the disputed waters between the two countries using its own rig and Vietnam does not want China to set a precedent. 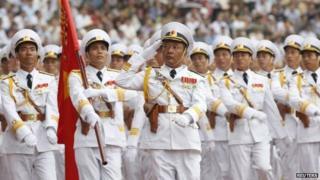 Hanoi said it would do everything possible to protect its rights and does not rule out taking legal action against China at an international tribunal. The US called China's plan "provocative" and urged restraint from both sides. But with dozens of ships from both sides confronting each other in the area, any careless move could ignite a bigger and potentially much more damaging conflict. Chinese officials said during a regular briefing on Wednesday that the oil rig was within China's territorial waters. "The disruptive activities by the Vietnamese side are in violation of China's sovereign rights," Hua Chunying said. The incident came as Philippine police seized a Chinese fishing boat and detained its 11 crew in another disputed part of the South China Sea on Wednesday. The boat carrying "large numbers of endangered species" was seized "to enforce maritime laws and to uphold Philippine sovereign rights", the Philippine foreign ministry said in a statement. China's foreign ministry called the action provocative and demanded the immediate release of the fishermen, who have been taken to a Philippine port. The Chinese fishing boat was being towed to shore and charges would be brought against the crew members, a Philippine maritime official told Reuters news agency. China's Xinhua state news agency said the fishing boat - named as Qiongqionghai 09063 - had been seized by an "unidentified armed vessel". "Several armed men forced themselves on to the boat and fired four or five shots in the air. They then took control of the boat," Xinhua said. China claims ownership of large parts of the South China Sea, including shoals and reefs, located off the coast of the Philippines. Vietnam, the Philippines, Brunei, Malaysia, China and Taiwan all have competing claims in the region.